I finished this quilt about a month ago, but haven't been able to take reasonable pictures until just the other day. This quilt was a practice in improv piecing. I enjoyed just winging it with this project. I pulled in various navy, green and neutral prints and solids. It was just a fun experiment in both color and piecing. This not a combo I've used before, but I really like them together. I worked on this project over a couple months when I felt the need for something different. The finished size is about 55" square. I chose not to square this quilt when I finished quilting it. Rather I trimmed it along the lines of the designs. The edges aren't overly wonky, but I like the effect it adds. I used this project as a practice piece for FMQ after I took Angela Walters' class on Craftsy. I tried out several different designs. Some I really enjoyed doing, others not so much. I love the wood grain design, but found it incredibly difficult on a domestic machine. It's bound in one of my favorite Joel Dewberry prints that works so perfectly for bindings. I love this quilt! So awesome!!! It looks fabulous! I think the wood grain quilting looks really nice despite the challenges! Beautiful .....another unique, creative inspiring piece of work!! That is a great one. I love the choice of colors. I love this color scheme, and the improv piecing is so fun. One of these days I need to try something improv. I'm impressed with your quilting--I'm impressed with any domestic quilting! I find it exceptionally difficult. I think yours turned out very nicely! I love it, Kati - very "Gees Bend"! 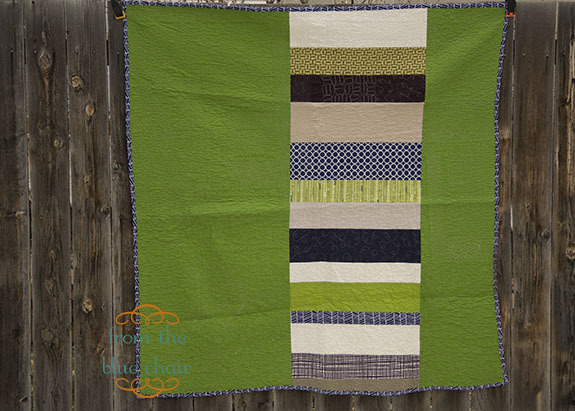 Your color choices are great and really make the quilt. I really like this quilt Kati - the colours really appeal and I think it has a great deal of movement and interest created by the improv piecing. 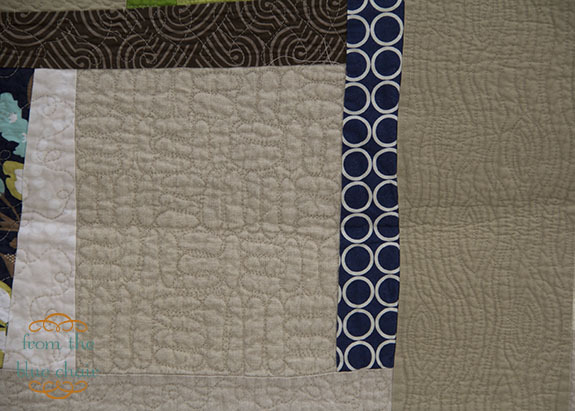 I did Angela Walters' FMQ class on craftsy too, and I have been enjoying trying out the designs, but it really makes me wish I had access to a long-arm quilting machine. 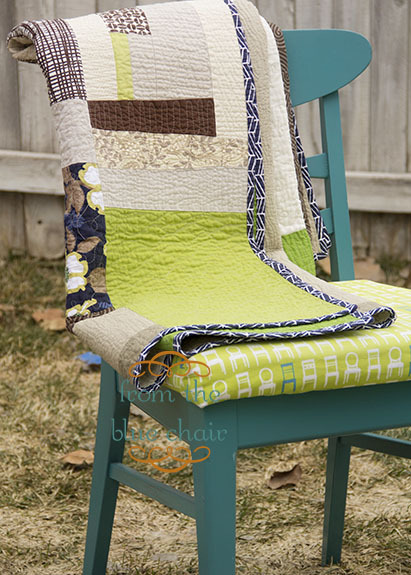 The colors, the improv, and the quilting are all so wonderful!! It looks great! I've been dying to try out these techniques since I took the class too. You did a good job on it. I ordered a new machine that I can actually FMQ on, and hope that it arrives by the end of the week. I was wondering if you think all of the quilting makes your quilt too stiff? My idea of a perfect quilt. GREAT finish! Love that you shared your process thoughts and experiences, too. Lovely! So which quilting techniques did you enjoy? I love the wood grain quilting design! Great job. 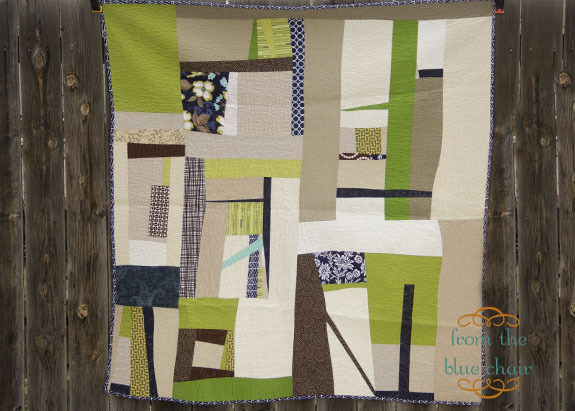 a practice quilt for fmq designs - great idea. 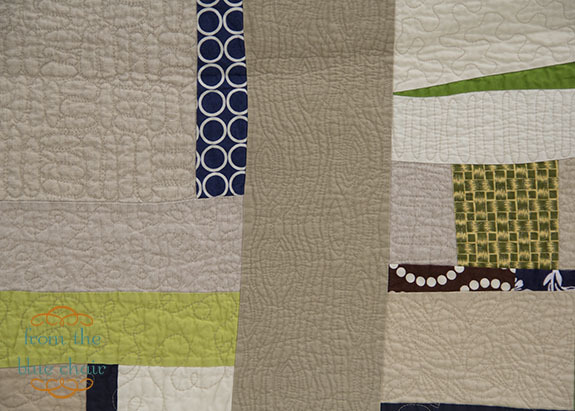 I like the woodgrain quilting, too, but was thinking it's easy (it looked so in the book)... I'm sure I really am wrong. I LOVE this quilt!!! So gorgeous Kati!! !